Consumers prefer sustainable—yet tech-friendly—design elements for their outdoor living spaces, according to the 2017 Residential Landscape Architecture Trends Survey conducted by the American Society of Landscape Architects (ASLA). For the first time, wireless/internet connectivity entered the top ten project types, suggesting that people want a backyard that allows them to enjoy both nature and connectivity. Landscape architects were asked to rate the expected popularity of a variety of residential outdoor design elements in 2017. The survey was fielded February 2 through February 16, 2017, with 817 responding. “The fact that more consumers want outdoor wireless access shows that they want expanded options for remaining connected to their devices,” said Nancy C. Somerville, Hon. ASLA, executive vice president and CEO of ASLA. 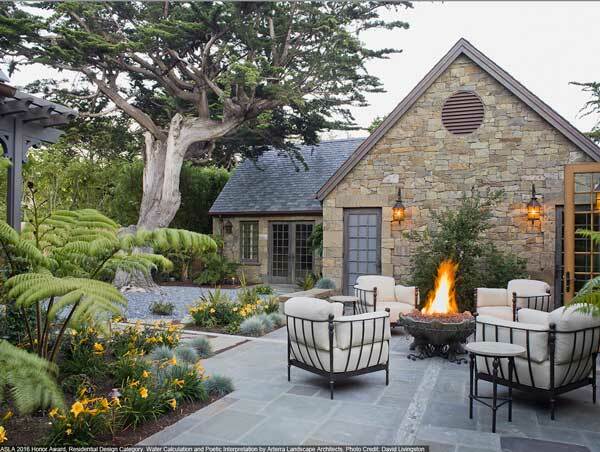 The top three most popular outdoor design elements include fire pits/fireplaces (71.51 percent), wireless/internet connectivity (70.77 percent) and lighting (67.83 percent). The top landscape and garden elements include native plants (81.60 percent), low-maintenance landscapes (79.25 percent) and food/vegetable gardens (including orchards, vineyards, etc.) (76.52 percent). Pergolas (50.33 percent), decks (41.35 percent), fencing (39.82 percent) and arbors (38.74 percent) are expected to be the most popular outdoor structures. The hottest sustainable design elements include native/adapted drought tolerant plants (82.31 percent), permeable paving (76.31 percent) and reduced lawn area (72.66 percent). The most popular outdoor recreation amenities for 2017 will include sports courts (42.38 percent), spa features (39.68 percent) and swimming pools (39.23 percent). For more landscape ideas for your home, and to find a professional in your area, visit www.asla.org/residentialinfo. High-res photos of residential projects that have won ASLA awards are available for media only. Contact Karen Grajales at ktgrajales@asla.org or (202) 216-2371. Founded in 1899, ASLA is the national professional association for landscape architects, representing more than 15,000 members in 49 professional chapters and 72 student chapters. Members of the Society use "ASLA" after their names to denote membership and their commitment to the highest ethical standards of the profession. Landscape architects lead the stewardship, planning and design of our built and natural environments; the Society’s mission is to advance landscape architecture through advocacy, communication, education and fellowship.